A podcasting network, ostensibly about video games, but mostly not. 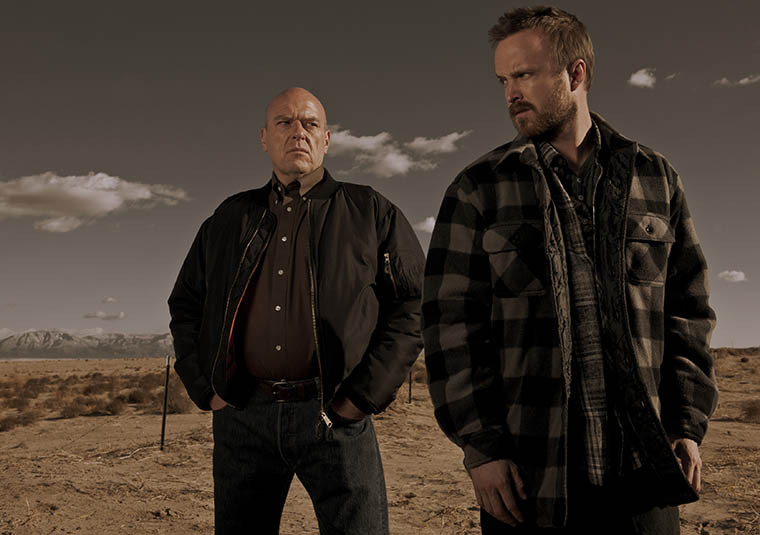 Thus far the final season of Breaking Bad has been a non-stop thrill ride leading to the sure to be explosive finally. However this week’s episode felt like a setup for the final four episodes of the series. While this may not have been one of its finest episodes, Breaking Bad always manages to make even the most mundane scenarios seem intense and important, which is exactly what “Rapid Dog” did. Jesse being caught by Hank in Walt’s home was a great way to create an unwilling partnership between the two. Both want vengeance on Walt, for very different reasons mind you, and so working together seems logical, but ultimately pointless. As said both have their reasons for wanting to get Walt and so both will simply try to use each other. Unfortunately though, it just seems that Jesse is the one who always seems to be the one that ends up being manipulated the most. This became poignantly clear once more in this episode. “We’ve come this far, what’s one more?” Skyler says to Walt in a drunk state, after Walt confesses as to what happened to the house. This was a major turning point for Skyler, for although she may have been connected to Walt’s murderous deeds, never has she suggested it. However, it was odd to see Walt protect Jesse at this point, telling her that Jesse has never killed anyone. Was it to protect his own skin or perhaps because he feels slightly guilty for indirectly killing Gale? It was a baffling moment that leads me to believe that perhaps Walt does in some twisted way care about Jesse. Skyler was not the only one to suggest putting the rapid dog that is now Jesse, down. In his terrible Old Yeller analogy, Saul brought it up once more, and to a degree so did Hank. Who cares, if some junkie with a change of heart decides to gain a conscious, and dies in the process? What is one more life, right? It was sad to see Jesse being manipulated in such a way once more, making him seem like the enemy, when in reality he has become but a victim to Walt’s hubris. It was a bitterly triumphant moment to see Jesse take matters into his own hands. After being so frightened to confess and meet with Walt, he decided to not play games anymore. Walking up to a payphone and telling Walt that he was coming after him was a bold choice, but one that he made without anyone forcing him too. The thing is will Hank support Jesse in his vendetta, or will he simply be another person Hank has to put away before reaching the king himself? There was a little moment in the episode that also grabbed my attention. Marie turning into Lady Macbeth, in front of her therapist no less, saying how she dreams of poisoning Walt was a very odd scene, and would seem out of place. However, these small scenes always make a difference in this show and so how crazy would it be if Marie actually does try to kill Walt- and succeeds. Worse though, what if she fails and someone she cares for is a victim of her decisions? Things are never so simple with this show. With Walt now being forced into a corner and needing to call upon Todd’s uncle for a little favor, the battle between Jesse and Walt begins. It will be messy and there will likely be bloodshed and victims on both ends, but to preserve his dying empire what is one more body amongst the ruins? Tagged with: AMC Breaking Bad Hank Jesse Marie Rabid Dog Skyler Walt What's one more? ERROR! REPORT -- A podcast about video games. Airs weekly on Mondays. Starring Clint Prentice, Evan Tognotti, Matthew Milewski, and Ryan McGinley. FAMILY GAME NIGHT -- Like Dungeons & Dragons, but also Call of Cthulhu, and an improv show, and a radio drama? Airs weekly on Wednesdays. Starring Clint Prentice, Evan Tognotti, Matthew Milewski, and Ryan McGinley. SUPERHERO SUPER SHOW -- Two super friends watch all of TV's superhero shows and talk about them. Starring Clint Prentice and Ryan McGinley. SHREKTALK: A SHREKSVERSATION -- A podcast where two friends and one Shrek-spert watch all the Shrek movies and talk about their cultural significance. Starring Evan Tognotti and Matthew Milewski. Guest Starring Clint Prentice. THE SERIES REGULAR -- A big-picture look at TV, new and old. Currently on hiatus. Starring Evan Tognotti and Matthew Milewski. YOU MIGHT ALSO LIKE... -- We make you mixtapes. We talk about music. Airs on the first of each month. Starring Evan Tognotti and Matthew Milewski. VFS VARIETY HOUR -- Two students in Vancouver Film School's writing program discuss their "craft." Airs weekly on Saturdays. Starring Evan Tognotti and Ross Jenkins, with weekly special guests. THE CREW 2 -- A special edition podcast dedicated to discussing the impending announcement of the sequel to 2014's hit open-world driving game. Airs sporadically. Starring Evan Tognotti.